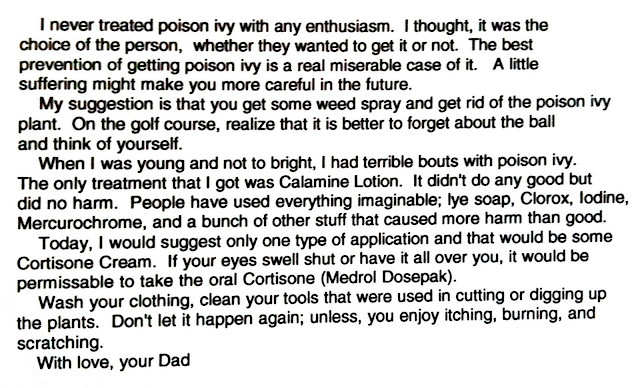 Last week I was looking through some old printed emails and I ran across advice about poison ivy from my dad, LeMoyne Coffield. Since Spring is on the way and the poison ivy is starting to grow I thought I would share this with everyone (including some good advice for the golfers). My dad was not only my dad but he was my (our) family doctor. He was a lot of peoples family doctor. He had a wonderful way of providing advice and recommendations to his patients. His medical advice wasn't always the easiest and quickest solution - but it was usually the best long term practical advice. I wrote him an email back in the Spring of 2000. I had been cleaning up an area behind our house and had gotten a bad case of poison ivy on my arms, neck, and face. I started the email by saying, "Thought I would let you know that spring has arrived -- I got my first bout of poison ivy. Some lessons you taught me as a child (and adult) have never gotten through." As children he was always pointing out poison ivy, showing us what it looked like, and hoping that we would learn how to spot it from a distance. My email went on to say that I had gone to see my primary care doctor and he had prescribed an oral steroid (prednisone) and I said, "What do you think?" Like I often did - I was emailing him for his second opinion. Below is his advice back to me. Good advice for anyone who is starting their spring yard cleaning. By the way - if you don't know what poison ivy looks like look at this and remember, "Leaves of 3 let them be."